Betta come in a dazzling array of colors. Pure red, yellow, blue, green, white, black and any number of subtle variations between them are evident. At the microscopic level cells called chromatophores are responsible for the colors we perceive. Betta chromatophores can be divided into two broad categories on the basis of the mechanisms by which they generate color. Some chromatophores contain pigment, or chemicals, that absorb certain colors and reflect others. Red and black are examples of such colors in Betta. Other colors, the best known of which are green, blue and steel, are produced an entirely different mechanism. These iridescent colors are produced using chemical constituents that are themselves colorless, but generate color by the physics of the interaction of light with surfaces. Such colors are often called structural colors, to distinguish them from color produced by pigment. To understand how structural colors are produced we must need to juxtapose two concepts that are likely familiar to everyone, but which most have likely not had occasion to think through in this context. The first idea is that when light hits a transparent surface some of the light will be reflected and some will be continue through that media. Everyone is familiar with the image of the glassy surface of a lake on which is reflected the perfect image of the sky. Some of the light hitting the surface of water is reflected off that surface while most passes through the air:water interface. Now this simple fact with which everyone is familiar is likewise true if matters are made a little more complex. Let’s consider more than one interface, say a thin layer of oil lying atop water. Here we have two surfaces. Light will hit first the air:oil interface and some light will be reflected back into the air, while some light will travel through the oil (Figure 1). Now the light travelling through the oil will encounter a second surface, that being the oil:water interface. Some light will again be reflected and some light will travel through into the water. Now we have two reflecting surfaces and that this simple complication is capable of generating a palette of color is evident, as everyone is familiar with the rainbow of colors that appear on oil slicks. To appreciate how an oil slick generates color we must first be reminded that light can be characterized as a wave. Any wave can be fully specified by establishing two features of it, its amplitude and its wavelength. Waves crashing onto a beach one atop the other have short wavelengths and those well separated have long wavelength. Wavelength is simply a measurement of the length from the top of one wave crest to the top of the next. Amplitude is a measurement of the height of the wave. Since light acts as a wave, it too can be characterized by amplitude and wavelength. In particular, the wavelength of light determines its color. Light of a wavelength of 650 nanometers (nm) is red, 590 nm orange, 570 nm yellow, and 510 green, 475 nm blue and so on. A nanometer is a very short distance, some 0.00000003937 of an inch. So when we see a surface as blue, what we are really saying is that light reflected from that surface has a wavelength in the range of 475 nm. We can use the fact that light behaves as a wave to figure out what will be observed not only when dealing with simple interfaces, but also with more complex arrangements like that of the oil slick. If two waves are combined, the wave that results is exactly the sum of the two at every point. Look at Figure 2. 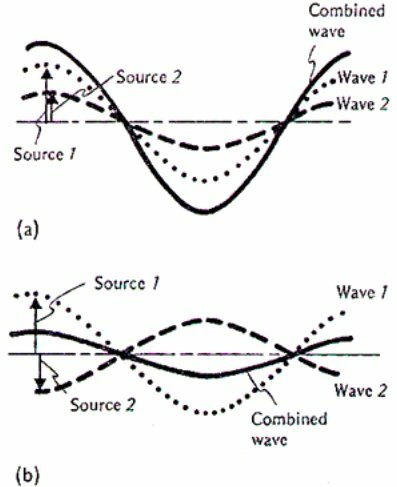 Let say that the two source waves in Figure 2 (a) are two radios playing the same tune placed at the same distance from your ear. The two sound waves will interfere constructively and you’ll hear a volume equivalent to the sum of the volume of the two. Now imagine the sound is not the same song, but one in which the sound wave from the first radio is perfectly out of phase with the first. 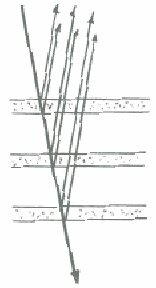 Again, as in Figure 2(b), the sound will be the sum of the two, but now the net sound you hear will be diminished, or even no sound at all. The reason is that two waves annihilate one another, just as do the waves generated by two speedboats traveling adjacent to one another. Indeed, this same principle is that which underlies the technology used in noise reduction headphones. The headphone seeks to generate a waveform that is precisely the inverse of that in the environment. You hear the sum, that is no noise at all. Let’s return to the oil slick. We know that the light we see is that reflected from both the air:oil interface and the oil:water interface. Now if a particular phase difference between light reflected from the two surfaces equals 1 full wavelength, then that color will be reinforced. Other colors that reflect from that surface, but are not in phase will be diminished, or if they are fully out-of-phase will be eliminated completely. When we see a reflective color on an thin film, that particular color appears because the wavelength corresponding to that color has been reinforced as in Figure 2(a), while those of other reflecting colors have been diminished or eliminated as in Figure 2(b). The above is a long digression anticipatory to the shortest of conclusions. The physics of light interacting with the top and bottom surfaces of material with a different refractive index than that of the medium in which it is imbedded is precisely what generates the structural colors of Betta. The iridophores of Betta and other fish are cells that contain crystalline inclusions, called platelets. The platelets are themselves colorless but are highly reflective. They occur not as a single platelet, but a stack of many such platelets (Figure 3). They generate the color, though, precisely as does the oil slick, with the effect being further reinforced by a stack of plates of uniform material and thickness reflection off the opposing surfaces each one of which reinforces the same wavelength of light. Figure 3. Schematic showing interference of light rays from a stack of thin films, as in the platelets of iridophores. The English poet, John Keats claimed his contemporary Isaac Newton to have robbed the rainbow of its beauty by his explanation of the colors as prismatic refraction. I trust that the explanation given above, first explicated by Thomas Young in 1801, will prevent no modern aquarist from enjoying the sparkle of iridescent Betta. All Contents Copyright Â© 2003. R/C Modeler Corporation. All Rights Reserved.